Mounting Holes on Centerline and Take #8 screws. Please check out Newest Released 2-wire Transmitters with Standard, FM & Hart Models Available TXUN Series for more advanced features and excellent usability. 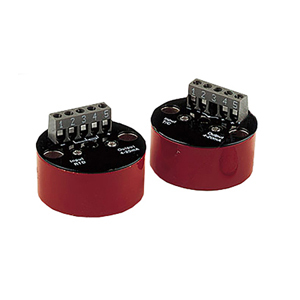 The TX250 Series are non-isolated two-wire transmitter which convert the T/C thermoelectric voltage into a standardized load-independent, 4 to 20 mA process current. The TX250 Series are housed in metal enclosures and fit into NB1 connection heads. The transmitter’s enclosure provides excellent RFI immunity. The transmitter calibration is set by six dip-switches located behind the top cover. There are three basic models which cover the various T/C types. TX251 is for T/C types K, T and J; TX252 is for type E and TX253 is for type R and S.
Dip-switch arrays select the T/C type, and set the "Zero" coarse level and the "Span" coarse range. Zero and Span trimmers provide the fine tuning calibration. The TX254 is a non-isolated two-wire transmitter which converts the measuring signal of a 3 wire 100 ohm Pt RTD into a standardized load-independent, 4 to 20 mA current which is linearly proportional to the measured temperature. The TX254 transmitter is provided with excellent lead resistance compensation and Pt-100 linearization conforming to BS1904 and DIN 43760 characteristics (a = 0.00385). The transmitter calibration is set by six dip-switches located behind the top cover. Three dip-switches set the lower measured coarse temperature and the other three dip-switches set the measured coarse temperature span. Dimensions: 44 Dia x 33 mm H (1.7 x 1.3") including the terminal block. Note: Transmitters are linear to the mV input from the thermocouple, not to temperature. Transmitter Scaling Recommended (TX-SCALED) unless you have a source to scale the transmitter! 참고: All transmitters require scaling. If TX-SCALED is not ordered, then scaling must be done in the field. Item required to scale include: means of simulation of the 0% and 100% input values, means to power and read the 4-20mA loop signal, understanding/ability to adjust dip switches and zero & span potentiometers.